Manages your Compliance Obligations under the Coal Mining Safety and Health Regulation and Act. This product has been a joint project between OST Database Group and the Mine Safety Institute of Australia (http://www.minesafetyinstitute.com.au). Up to date information about mining health and safety regulations. A facility to allocate responsibilities for each section of the legislation to relevant company personnel. A facility to categorise all sections of the act by applicable sections of the standard, and by document, process and vocation types. The ability to link positions and personnel with associated training, and these in turn with sections of the legislation. Comprehensive search and filter facilities to quickly locate legislation details and associated responsibilities. Assists with the management of your mining legislation compliance via a web-based (24/7/anywhere) computerised system, making this obligation structured, readily available, timely, and organised. A dedicated system such as this focuses your company's attention on the objective of keeping people safe. 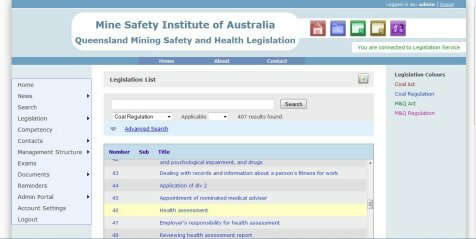 Search and filter all sections of the Australian Coal Mining Safety and Health Act and Regulation. Categorise the Act and Regulation using your own company's corporate standards, applied documentation, process and vocation types. Add and enter your company's position titles and link these to current personnel, adjustable into the future. Allocate positions to each section of the legislation, defining their responsibility obligation(s), eg: Develop and Maintain, Implement, Apply and Monitor, etc. Link training competencies to the various position types and to personnel - looking to ensure personnel are appropriately trained to manage their responsibilities. The Mining Legislation Database can be customised to link the regulation items to your company's current safety documentation - Risk Assessments, SHMS's, SOP's, etc.